For centuries, the Hazelton area has been home to the Gitxsan and Wetsuweten people. Since the 1860s bustling pioneer communities have also arisen around the confluence of the Skeena and Bulkley Rivers. The Hazeltons, there are three - Hazelton, New Hazelton and South Hazelton, are located 45 miles west of Smithers on the Yellowhead Highway . Hazelton, also known as Old Hazelton is located on the banks of the Skeena River about 6 miles off Highway 16. Adjacent to the town, where the Bulkley and Skeena Rivers meet. 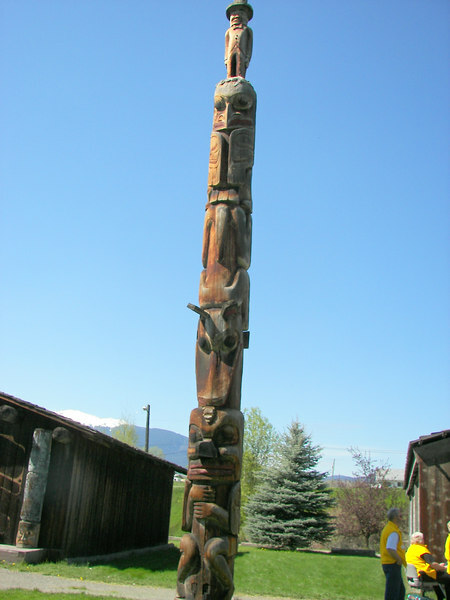 The bare Mother Totem Pole.